John Wayne, a long-time resident of Southern California, was a fan of Southwestern cooking and co-owned a large feed ranch in Arizona. Lauded as his favorite casserole, this recipe appeared in the L. A. Times, back in the '70s and every swingin', fondue-loving family apparently had a copy of it. I know we did, as it was a once-every-other-week meal at our house. The caserole comes out of the oven, looking like a soufle, but then it falls and that's OK, so don't worry. The recipe reportedly came from a cook on a movie catering truck, who used to make this for "The Duke," by request. Whether or not this is true, the recipe is still great today. Combine cheeses and chiles and spoon into a well-greased 11-by-9-inch or similar-size baking dish. In another bowl combine egg yolks, milk, flour, salt and pepper and mix until well blended. Fold beaten egg whites into yolk mixture. Pour egg mixture over cheese in casserole. Using a fork, swirl egg mixture through cheese. Bake for 30 minutes. 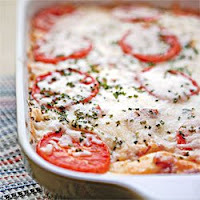 Remove from oven and decorate with sliced tomatoes. Bake 30 minutes longer or until a knife inserted in the center comes out clean. Let stand a few minutes to set; serve. PER SERVING: 525 calories, 34 g protein, 8 g carbohydrate, 40 g fat (25 g saturated), 223 mg cholesterol, 880 mg sodium, 1 g fiber. So, whatcha waitin' for Pilgrim? Oh... great Idea! This would be an excellent side dish for Thanksgiving!